Q. Sicinius & C. Coponius. 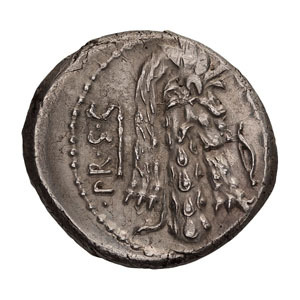 Denarius, 3.97gg. (3h). Rome, 49 BC. 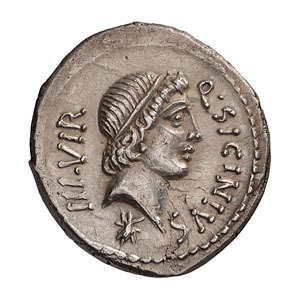 Obv: Head of Apollo right, star below; Q.SICINIVS before, III.VIR behind. Rx: Club of Hercules surmounted by lion skin with scalp to right; arrow on left, bow on right; C COPONIVS PR S C around. Crawford 444/1a. Sydenham 939. RSC Sicinia 1. Sear, Imperators 3. Mint State.